These are just the changes that have been rolled out in average schools. School districts, academies, and other places of learning that have chosen to really embrace technology have advanced even further. What’s the average classroom going to look like in the next 5 to 7 years? 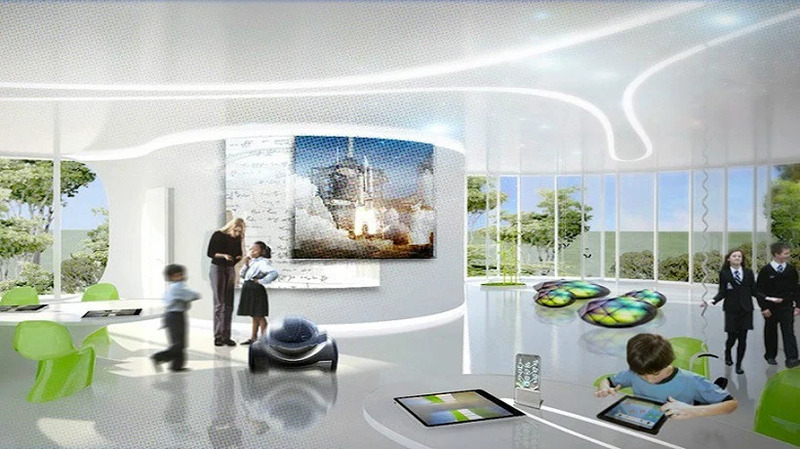 Here are 4 solid predictions about the classroom of the future. The layout of the classroom will change immensely. Standing desks for students who have difficulty maintaining focus while sitting. Accommodation for students who need more movement. Private workstations will be available for individual tasks while collaborative workspaces will be available for group projects. Interactive projectors and other technology will replace interactive whiteboards. Students will be given more autonomy on how and where to sit. Moving walls will make spaces more adaptable. Virtual and augmented reality will change the educational landscape. Imagine this: A student opens a book to what appears to be a page with a picture of the earth on it. Then, the student puts on a pair of special glasses and a three dimensional images pops out at them. Now, instead of seeing a simple, flat image, they can see various landforms; look at a cross section of the planet to see all of the various layers going down to the earth’s core. Picture a student walking through an art gallery and scanning a code next to a picture using a special app on their cell phone and then being able to watch a video of the artist speaking about their own work. This is all possible today because of a technology known as augmented reality. Apps and other educational devices act upon trigger images to create an augmented learning experience. Here’s something else to imagine: Middle school students in a rural classroom, more than 100 miles from the nearest major city are told that they will be spending the day touring a science museum. There are no buses to take them anywhere. Instead, the students are each given a pair of inexpensive virtual reality headsets that have been constructed largely from cardboard, and a glove. With just these two items they are able to virtually walk through the museum, page through books, watch presentations given by docents, and view any image they want from any angle. What does all of this mean for the classroom of the future? It means that geography and finance will cease being a barrier for teachers who want to give students access to enrichment material that can only currently be found outside of the school building. It also means that various learning styles can be accommodated by adding sound, video, images, and interaction to what used to be a text based, 2 dimensional world. Flexible assignments will accommodate multiple learning styles. Today, in the majority of classrooms, students all complete the same assignments. For example, if the assignment is to use MS word to write a research paper on tools developed during the Bronze Age, which is the assignment each student must complete. The only time when exceptions are made is usually when the student has special needs and accommodations are required. Unfortunately, these one size fits all assignments don’t take into consideration learning styles. With flexible assignments, the teacher will be more interested in proof of competency than in receiving 25 assignments all completed using the same methods. So, instead of passing out an assignment to write a research paper, the teacher will outline for students what skills or understanding they must demonstrate to successfully complete the assignment. The student will then be given the autonomy to decide how they will do that. This might include recording a video, creating an elaborate timeline, giving a presentation, or putting together a traditional research paper. MOOCs and other online learning options will impact secondary education. You have to stay in school. You have to get good grades. You have get your diploma. If you don’t do these things, you cannot get into college. If you don’t get into college, you won’t be able to get the degree that leads you to the career that you love. All of these seem like very logical statement, and chances are most people reading this were raised being told these very things by their parents and their teachers. There’s just one problem. The diploma simply isn’t as necessary or as valuable as it used to be, and neither is the college degree. In the future, students will feel less inclined to spend 4 years in high school learning the basics, plus another 4 years in college, especially when the first two years is simply covering the basics yet again. Today, a thirteen year old with an email address and access to the internet can sign up at Khan Academy and complete courses of study in a variety of academic disciplines, all for free. They can sign up for free classes designed and taught by professors at prestigious universities that are created and distributed using MOOC. In the time that it takes to finish high school, a student who is particularly motivated could have mastered multiple technologies; learned as much about history, business, mathematics, science, economy, etc. as a college graduate, and earned industry recognized certifications. Does this mean that high school and college are becoming irrelevant? Absolutely not. There will always be students whose goals and educational needs are best met through a more traditional educational model. Just as there will be always be certain professions for which a more regulated and verifiable educational process is necessary, e.g., the medical fields. What it does mean is that schools will have to become more flexible and learn to accommodate the needs and goals of each student. This could be done by giving students more options when it comes to the educational path that they choose, creating cooperative educational programs with outside institutions, implementing flexible schedules, and allowing the option of distance learning. Many schools might consider offering alternative learning environments, not just for students with behavioral problems and other issues, but also for students with specific interests and areas of focus. Technology will certainly be a major factor in how education in the future differs from education today. However, it won’t be the only influence. Successful educators will realize that they need to rethink the entire model of education and redesign it so that it is more student-centered. This means adopting new technologies, but it also means giving up on archaic attitudes about what constitutes educational success and recognizing that educational competition is a reality.